Naipes Inca was one of Della Penna's leading brands of Spanish-suited playing cards, and was produced in successive editions until the company was taken over in 1978. (The Incas, of course, were an indigenous South American tribe which flourished from ca.1438 AD until the coming of the Spaniards in 1532). From this page you can see details of the various editions of Naipes Inca and their approximate dates by following the links. Left: black & white logo from four of cups of earliest known edition. The company name is given as C. Della Penna & Cía and the title Naipes "Inca" has the quotation marks only around the word "Inca". Left: logo from four of cups of most common version of Naipes Inca which appears to have been registered in 1943. This version spanned the period during which the tax stamp changed from a "Mercury" head to "Marianne", and so can be dated any time from c.1945-c.1965. The main detail to notice is that the company name C. Della Penna S.A. is in a serif typeface. All the other versions are in sans serif. Very small changes in detail can be observed between examples, showing that the plates were re-drawn on several occasions. For example, the typography of the words "Industria Argentina" can vary, noticeable in the letter "G" which can have a straight or curved ascending bowl. 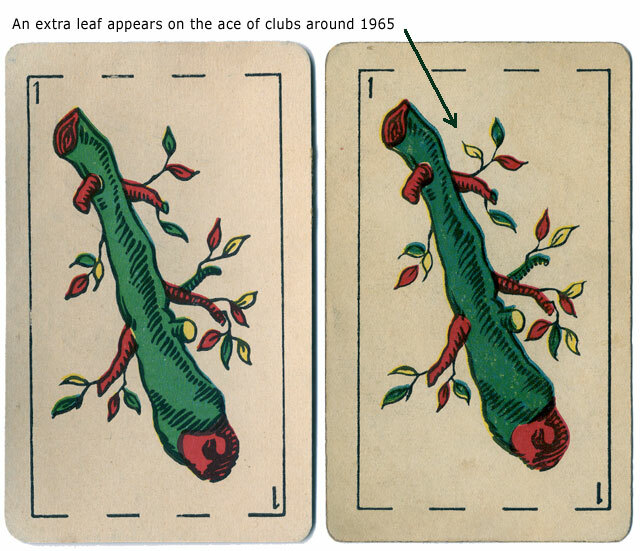 During this period, the logos on Naipes Porteño and the cards themselves were also re-drawn, and boxes were introduced instead of paper wrappers only, c.1960. Left: in this version, the company name is given as "Della Penna S.A." - without the initial "C", and is in a sans serif typeface. It is not clear why the lettering is not central, as though the initial "C" had been deleted and a blank space left in its place. Also the words "Comercial - Industrial" span a shorter distance than on the example above. Left: logo from four of cups from a later edition of Naipes Inca. The indian's headband is blue, and the initial letter "C" has been replaced before the company name, which now reads "C. Della Penna S.A."
The lettering of the words "Industria Argentina" is higher than in the previous version, and the overall size of the cards is smaller. Advertising decks are common from this period.